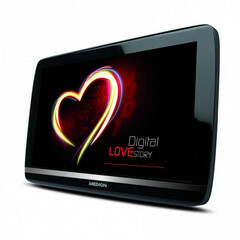 Medion the Consumer electronics company is launching a new Android tablet called the Medion Life Tab. There’s no word on when it or if it will be released in the US, but this model is expected to hit the markets of Europe by the time of Christmas. The Medion LifeTab has a moderately unusual design with a rather large screen bezel and rounded edges. This model will be mainly powered by Android based Honeycomb 3.2 and is equipped with 1 GHz NVIDIA Tegra 2 dual core processor. The 10inch screen is a capacitive multi-touch display providing a resolution of 1280 x 800pixels. Storage provided for this model is 32GB and even a micro SD card slot. Two cameras one in front of 2MP and another to its rear of 5MP are also added. The integrated speakers are said to be equipped with Dolby Mobile and Dolby Digital Plus. For connectivity it has micro USB, micro SD/ micro SDHC, docking connection and Bluetooth 2.1. You also get HDMI output, GPS, 802.11b/g/n Wi-Fi and quad-band HSDPA. Medion also loads up the tablet with a few extra apps including Documents To Go and LifeTab media software. This model weighs around 720gm (25.4oz). A lithium-polymer (24.7WHr) battery runs this device. Medion may release the LIFE TAB with a price of 399 € (equivalent to $566) in Europe.